There are not many spiral stairs like this one. This is a free-standing spiral stair that is connected at the top and bottom only. The staircase is Aluminum, 40' floor-to-floor, 8' diameter with a 12" center column, and is powder coated. It was built to stringent specifications. Stairways, Inc. sold the stair to Chicago Bridge and Iron. A 12" Aluminum pipe is only available in sections less than the total length of this particular stair. Sections had to be welded then the welds were sanded smooth. The structural integrity of this stair is met with a 40’ span. There are not many powder coaters that can handle a spiral stair of this magnitude. Stairways, Inc. works with a local powder coating facility that is able to meet our needs. 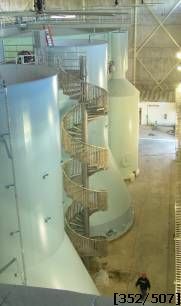 We designed this spiral stair to specifically fit in their ovens and also have the capability to move easily throughout their plant. Transporting of the stair was done in sections with all parts wrapped. The stair arrived at the job site ready to install. The end user of the stair makes and supplies energy. Their plant will be in operation for many years to come, and this spiral stair was designed for low maintenance and a long life.